Nassau County Legislator Rose Marie Walker was pleased to attend the annual Auxiliary Police Longevity Awards Ceremony at Nassau County Police Headquarters. 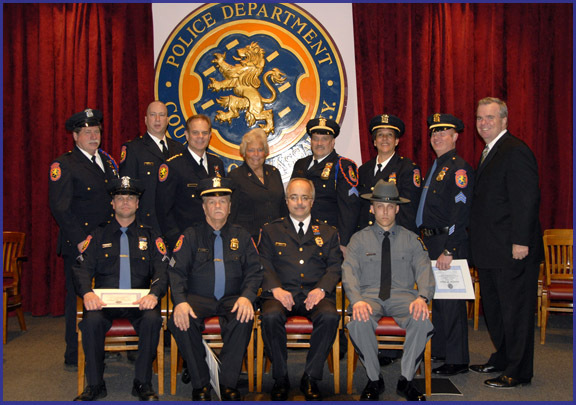 This important event celebrates the dedication and devotion of the members of the Nassau County Auxiliary Police. Their continued volunteerism is what makes our communities and our County one of the finest in the Nation. Pictured: L to R: (seated) Ralph Ronconi; James Cudney; Insp. Mike Bier; Daniel Pilero, State Univeristy Police. Insp. Joann Edling; Sgt. Alex Lombardi; and NCPD Acting Commissioner Tom Krumpter.